Although the thought of pumping on a plane mid-flight–be it domestic or international–can be daunting, in reality it is completely doable. I have pumped dozens of times on dozens of flights. It really is all about having the system down. In my experience, the best solution is to book a window seat. I pump at my seat on the plane, not in the lavatory. Pumping in the lav is problematic for numerous reasons ranging from the smell, to the cramped space, to the fact that you are tying up a scarce resource for 20 to 30 minutes, to the fact that it is a terrible place to be in the event of turbulence. I have never had anyone say anything negative to me about it nor, to my knowledge, has anyone said anything to one of the flight attendants. Pumping on an early morning flight to Calgary, October 2014. To pump at my seat, my first step is to put down the tray table and get all of my equipment out. 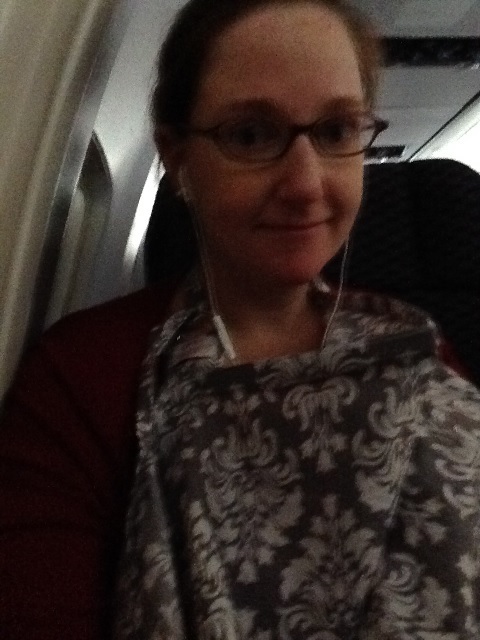 I keep the pump, storage bag for the pumped milk, and wipes (for dirty parts) on the tray table. I leave the cooler bag in my pump bag under the seat in front of me until I’m done. Depending on whether the plane has power outlets at the seat or not, I either plug in the pump, or use the battery back. Keep in mind that the power outlets are disconnected when the plane’s altitude is less than 10,000 feet. Also, the pump is not a small, lightweight portable device, meaning that you have to wait for the 10,000 feet “ding” following take off before you can pull it out and start pumping. Likewise, it is best to finish pumping at least 30 minutes before the plane lands to make sure that you have time to put the milk away and clean up before tray tables and carry-on bags have to be stowed. I place the assembled pump parts in my lap and then put the pumping bra on over my shirt and unhook the clasps on my nursing bra. Then, I put the nursing cover over top and set myself up. When the plane is dark, I use my mobile phone’s flashlight feature to make sure that I have proper alignment of the flanges and check that all of my anatomy is properly lined up in the flanges. I hook up the pump tubes under the nursing cover and turn on the pump. Once I’m done pumping, the clean up process is the same as with any location. Generally, I put the milk bottles on the tray table and clean myself up first so that I can remove the nursing cover, because the space is cramped and it makes it easier if I am not trying to keep myself covered up while putting the milk away. Typically, I wipe the used parts off and store them in a mesh bag (separate from my supply of clean parts). If I am going with a DIY ice pack solution, I will then ring the flight attendant call button and ask for ice (see Transportation). On long-haul flights, my general rule is to pump approximately every four hours. Then, when I land, I reset my schedule to the local time. For example, from Houston (IAH) to Tokyo (NRT), nonstop, is just about 14 hours. I would expect to pump 3 times on that flight and, when I arrive around 4pm local time the next day, then I would pick up with my next regularly scheduled pumping time. On short-haul flights (generally, anything under four hours), I pump following my normal schedule and then reset to local time when I arrive. I find that having an app on my phone particularly helps with keeping track of pumping times when I am traveling.